I’ve been an avid reader of Private Eye since I was a teenager and my dad brought a dog-eared copy home with him after a trip to London. From that point on it was my connection to a wider world outside of my hazy Midlands youth; a cynical window on the grimy London media and political worlds. In the years since then I’ve moved to London and started working for a media company myself, and although I still buy the Eye fortnightly, I treat some of its stories with slightly more scepticism now that I work in some of the environments it writes about. I think it’s a great publication, and I always secretly enjoy skipping straight to their “Street of Shame” section to see what drubbing they’ve handed out to the Guardian this week. 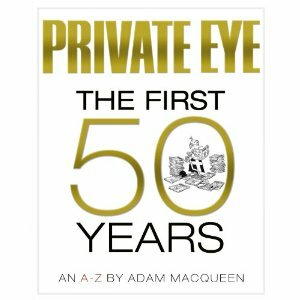 I bought their 50th anniversary tome, Private Eye: The first 50 years before Christmas, and gradually devoured it over several weeks. It’s a hefty wedge of scrapbook-esque A-Z notes on the mag’s history, and quite an illuminating read. A couple of entries caught my eye, though. As a result [of its unwillingness to put content online for free], the Eye was celebrating its highest circulation figures in eighteen years in 2010, while newspapers like the Guardian which had spent the previous two decades enthusiastically seeking out new and expensive ways to give away all their content and more online have seen their sales drop by around a third in the same period. Setting aside the justifiably bragging tone of the paragraph, the main point of the above extract is really quite a jump to make. The book suggests that the Guardian’s well-documented financial problems are the result of it “giv[ing] away all [its] content”, a statement that fails to properly examine the current media climate in any meaningful way. The Eye‘s unprecedented circulation success last year is commendable, but then, how many competitors does it really have? Punch hardly fulfilled the same function and Viz is laughably lowbrow in comparison. Private Eye could probably continue its current circulation if it was printed on the back of beermats. I know I’d still go out and buy it. Old media’s obsessions with the medium mean they fail to remember the whole point of what they’re doing: the readers. A high print circulation is nice, but the Guardian (whose print sales figures aren’t much higher than Private Eye‘s) eclipses the Eye‘s 210,000 print customers in less than half a day, every day, on the web. If the Guardian had chosen to go the Times route of a paywall, then those numbers would suddenly look a lot smaller. In a digital society where broadsheet print newspapers are struggling, is it any wonder that new, experimental models are being tried? I notice the Eye doesn’t single out the Evening Standard et al for giving away all of their content for free too – wonder why? This is, of course, exactly the sort of relationship with readers that most media companies are investing millions in trying to create via their websites, Twitter feeds, and Have Your Say initiatives, and twenty-somethings with words like “Community” in their job titles are insisting is new and revolutionary concept. But it’s been going on at the Eye since the days of fountain pens and 6d first-class stamps. Once again, we’ve got the schoolboyish boastful tone, but ignoring it once more, the wilful ignorance here is again quite profound. For one, criticising twenty-somethings for thinking they’re creating something “new and revolutionary” seems to ignore the fact that the Eye itself, hardly the first satirical publication ever sent to press, was created by, er, a bunch of twenty-somethings. Secondly, I’d argue that the twenty-somethings I know with “Community” in their job titles would never claim that their role is particularly new and revolutionary. Rather, I think, they’d say that they’re playing a variation on the kind of role that used to take place when readers bothered to write in using fountain pens and stamps, and figuring out how it applies in the digital age. Even the entry itself proceeds to admit that most of the Eye‘s letters for publication now arrive via email. I can understand Private Eye‘s scepticism of the web and free/open content, and agree that it would never work for them – they’re too clunky and conservative (small C) to keep up with it, and their only-updated-every-fortnight Twitter account bears this out. On the other hand, though, they should have the wit to recognise that their unique situation doesn’t apply to every other media company, and the ones that are daring to try new things or work out how to translate the old-fashioned rigours of print into the ever-varying world of digital are actually working with the same pioneering, anti-establishment spirit that the Eye itself is supposed to embody. Endnote: Not an Eye reader? This page might clue you in on the origins of “Glenda Slagg” in the headline.